Contributing to the sustainability and the protection of vulnerable nature is becoming an important part of the travel experience for very many tourists. At the same time, the allure of unspoiled places at a safe distance from the hustle and bustle is a constant and strong impetus for travellers. Combining these two - at times conflicting - impulses can be a challenge. In Northern Norway, meanwhile, the outlines of an ambitious project that combines precisely those elements - breathtaking scenery and a clear environmental conscience - is coming together. Next year construction will begin on the hotel, simply namely "Svart" (i.e. black), and which will be located right in the heart of Norwegian nature. And the twist? The building is a so-called "powerhouse", which produces more energy than it uses. The hotel will have a demand for energy that is fully 85 percent lower than a typical modern hotel, according to the architectural firm, Snøhetta, which has thought up and designed the building. "This will be the world&apos;s most environmentally friendly hotel," says architect Zenul Khan to D2 magazine. Svartisen is Norway's second largest glacier, and Svart will be situated in one of the glacier arms in Meløy municipality - with parts of the building anchored in the Holandsfjord and having a panoramic view of the area's beautiful and majestic nature. "Building in such a precious environment as that of Svartisen places some very clear demands on us as architects. We must safeguard the natural beauty of the area and protect the flora and fauna," says founding partner of Snøhetta, Kjetil Trædal Thorsen. Preserving the local nature is a beautiful thought that requires thoughtful solutions in order to take the step over into the practical realm. One of the key measures Snøhetta have taken includes mapping out how the sunlight hits the area so that solar energy can be harvested with maximum efficiency. The solar panel that will cover the hotel roof is produced locally with energy from hydroelectric power. "It is extremely important to us that Svart leaves a minimal footprint in the pristine Northern Norwegian nature. 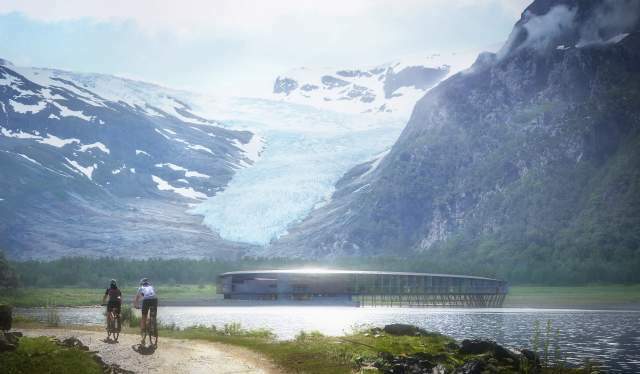 Creating an energy-positive hotel, which has a corresponding low-impact operation, has been absolutely crucial to developing a tourist attraction with a focus on sustainability and respect for the area's rare plant species, its pure glacier water and its blue glacier ice within the unique community around the hotel," says Trædal Thorsen. Snøhetta is by far Norway&apos;s most well-known architecture firm internationally with the Library of Alexandria, the Opera House in Oslo, and the Memorial Pavilion in New York commemorating 9/11 being among their most important works. Like most architects, Snøhetta are concerned with the balance between functionality, sustainability, and aesthetics. This applies every bit as much to the hotel project at Svartisen. "It has to look good. If our environmental projects do not inspire imitation - then we have missed our mark," says architect, Elin Vatn, to D2. And good - not to mention spectacular - is how it will look. That is, at least, if the available drawings of the project are anything to go by. The circular-shaped hotel has panoramic views of the fjord thanks to its many large windows, which provide for an extreme proximity to the nature all around it. The load-bearing system consists of wooden poles - a conscious nod to the area's building traditions that include fishermen's cabins and fish-drying racks - and wood will also be the main material for building and covering the hotel itself. It will not be possible to get to Svart by car. However, the poles will serve as a pier for boats, and there will also be opportunities to paddle under the hotel structure, at both high and low tides. The construction of Svart is scheduled to start in 2019, on assignment from the company, Arctic Adventure of Norway, which focuses on sustainable tourism in Northern Norway.